It has been a rough ride being an NFL fan and having one option for video game representation. Madden NFL has had a bit of a roller coaster existence since becoming the monopoly that it is. Franchise Mode has been the primary victim when it comes to changes to the game. It has also been the elephant in the room when fans are asked for feedback from EA Tiburon. It seems that the Franchise Mode/CFM/CCM team has finally realized (for Madden 17 at least) that customized rosters and real world features are key to people enjoying Franchise Mode. There are a couple changes new to Madden in general but the real changes seem to be the things that have been featured before or needed since the monopoly took effect. 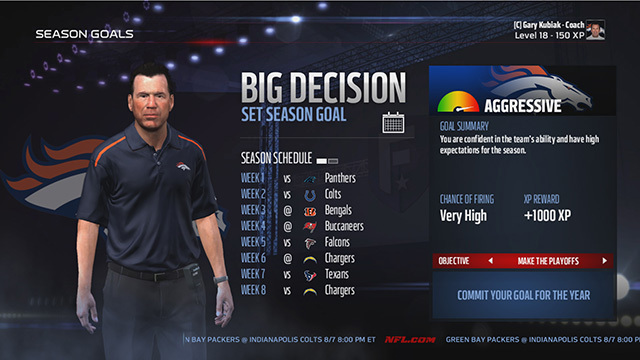 Coaches Are The Least Important Aspect of Madden Franchise Mode – This isn’t a big decision… it’s a non-decision. First, the things that truly matter the most when it comes to Franchise Mode improvements. Full Player Editing – This isn’t new as they might want people to believe. It existed in Madden 12 and provided much needed customization for rosters. The fact that this is available to online leagues is also a nice touch. To add that any changes will be shown in the Transactions is a nice and necessary perk for league members as well. The biggest curiosity for me is whether or not we will be able to edit Draft Classes before the draft or if we will have to draft players that are once again less than stellar prospects and edit them all to resemble legitimate rookies. Practice Squads are finally entering the Franchise Mode universe. It was always puzzling to me that EA would make claims about not having the resources to put certain small aspects into the game. This was one of the many that was apparently a matter of time. Now we can have players on a practice squad as long as they have played fewer than two full seasons in our respective Franchise Modes. It will be nice to know that I can take a flier on that 7th Round WR that can run like the wind but catch like Simple Jack. Dynamic Development is one of the aspects that I am skeptical of when it comes to Madden. They have tried and failed to implement all sorts of development and player growth from season to season. Now they are putting the trait of Development into the front of how players grow in ratings. The broken season awards system is going to play a strong role in how players are moved up and down in development traits as well. It really makes no sense for players to be pre-rated in this way as Slow, Normal, Quick, and Superstar. Make every player start each season with the same baseline and allow the season to determine how each player progresses. Sure, Tom Brady is and has been a Superstar, but he isn’t too far from being done. Then we have players like Robert Griffin III that have played up to par in their rookie year and then either fall apart or get injured. Maybe he comes back and becomes a superstar after this season. His slow development rating might say otherwise. The other changes like ‘Big Moments’ and the ‘score ticker’ make me scratch my head. I love the idea of a score ticker and believe it has been needed for years. This doesn’t change the fact that Franchise Mode has yet to make it feel like anything more than a single team focus that misses out on an entire story outside of your own franchise. Big Moments are rather insulting as it looks like they want to make the user think that every moment is a big moment. ‘First Drive of the Game’ is probably the least impressive in-game ‘Big Moment’ I have read about. The non-game Big Moments are laughable. Injuries, Free Agents and Coach Re-Signings aren’t big moments. Signing a coach is the least important aspect of Madden and they call it a Big Moment. Give me a break. Madden does seem to be making strides this year. I am actually excited about it this season. As jaded as I am and seem to always be about Madden, I am truly excited to play it this year. I just wish 2K would shock the world and release a new football title.